Over the years a number of variants have been proposed for boards featuring hexagonally shaped cells (commonly called hexes). The most popular of these is Hexagonal Chess which was invented in 1936 by Wladyslaw Glinski of Poland. C'escacs hexagonal chess uses a bigger board than Glinski's and some new pieces are introduced, something like an hexagonal Capablanca's chess variant; of course there is the pawn moving question. That question is a little contoversing, and is the main difference between Glinski's hexagonal chess and Dave McCooey's hexagonal chess variant. The problem with pawn moves in hexagonal chess variants is that any other piece increments its movility related to traditional chess, but pawn doesn't. C'escacs pawns have the three forward ortogonal moves. On the need of counterbalancing the excessive mobility that Pawns have a new rule is added: the rule of the scornful pawn capture. Besides note that the number of pawns is small in relation to the board size. An other interesting gesture is castle. On that move the king does one knight move, that is to say the modern concept of castle is combined with the historical move of Chaturanga Chess, the most ancient chess known, which allows the king to make a single knight move along the game. An appet to try C'escacs can be found (sorry, not available, will be restored soon) at:C'escacs Java Applet and also on C'escacs-L Java Applet for the C'escacs-L variant, but machine doesn't move yet. The board has 169 hexes which incorporate three different colors: better choose is white, black and colored. Central hex will be a colored one, and the board position is so that white king and white queen are placed on white hexes and black ones on black hexes1. Pawns have an initial two-step or three-step move option. En passant captures are allowed. The scornful pawn capture rule applies. Pawns promote when they arrive to one of the hexes defining the opposite side of the board. There are five possible castle moves, and rules for castle applies. Stalemate earns 3/4 points for the player delivering it and 1/4 point for the player stalemated. orthogonal move - A move wherein a line piece exits one hex and enters another by crossing a common border. Orthogonal moves are never colorbound. diagonal move - A move wherein a line piece exits one hex and enters another by following the line which connects their nearest corners.3 Diagonal moves are always colorbound. We need the Orthodox Chess pieces, with an extra Bishop and Pawn, a Dragon or Chancelor (often represented as half Rook half Knight), two Pegasus or Cardinal (often represented as half bishop half knight) and two Almogavars for each player. "Hex pieces" move differently than those of Orthodox Chess, but their moves are arguably similar. The Pawn can move passively ortogonal stright forward or 60° to the right or left of straight forward, or move to capture with a forward diagonal move. When a pawn is on an initial hex it can move up to three hexes on any forward direction (three diferent ones). Pawns two/three step initial option. Pawns have an initial two-step or three-step move option. A Pawn, which arrives on a friendly Pawn's starting hex, regains its initial two-step or three-step move option. When a pawn is in front of an opponent pawn and it makes a 60º forward evasive move it can be captured on the next move by the pawn it was in front of. The capture move in that case is an special move because the pawn move to capture 60° to the right or left of straight forward, with an orthogonal move. The scornful pawn capture rule also applies when the pawn on its scornful move reaches an hex at the end of the board and promotes. A Pawn making an initial multi-square advance may be captured by an enemy Pawn, if the advancing Pawn passes through a square that is guarded by the enemy Pawn. To capture, the enemy Pawn moves to the vacant passed-though square and removes the advanced Pawn from the board. The move is the usual pawn's move to capture but the capturaded pawn isn't at the move destination hex. There are 6 diferent en passant captures of a two-step moving pawn. There are the same 6 captures for a three-step moving pawn and other 6 because it could be captured on the second hex it walks throw; that is 18 diferent en passant captures. En passant capture applies also when, if the move would be of only one hex the pawn could had been captured applying the scornful pawn capture rule. So there are 4 additional en passant capture moves. There is a total of 22 en passant capture permutations. Castle is a move that a player can do only one time along the play. It's a two pieces move: the King and a Rook. Castle consists on a King knight move and a Rook move so that it cross the destination hex of the King and places on king's next hex. The King and the Rook that moves must not be moved before along the play. The move can't be done if the king is being checked. The hexes the Rook cross on its move must be empty. Of course, destination hex of the King can't be threaten. There are four King's possible moves, that sum a total of five diferent castle possible, because the move that places King on central column can castle with both Rooks. Castle is a complicated move, it's an evasive move more than defensive, and it must be done carefully, looking after king's new position. It works very well as estrategic evasive move when preparing an ofensive disposition of pieces. When the destination hex of the King is threatened, it is a valid castle move when the new position of the Rook prevents the King from being checked, an special case that doesn't arise on orthodox chess, on which the King "travels" through the cells instead of making a Knight move. Note that on C'escacs exists a castle on second play move, when the fist move is King's Rook's Pawn. Castle is usefull under concrete circustances quite different from ortodox chess; use it only when they appear. It's not usual to castle on a C'escacs match. I like C'escacs as it is, but anytime I play on a public place threre is always someone who asks about the "empty holes" of the initial setup… so, the answer now is "you can place two Lions there, if you dare". The Lion (also called Centaur or Duke), non royal King-Knight compound, is a very powerfull piece and makes a very interesting game development. Read more about Lion on the C'escacs-L page, but I've to admit I've just make a few tries that way, as C'escacs is yet quite complicated and introducing Lions makes really a new game. The name of "Lion" was choosen because all Knight moving pieces on C'escacs are (mithologic) animal formed; Lion is quite near from mithologic beasts and it involves some kind of "royally"…. The non royal King somewhere is named as "Man", and then the Man-Knight compound is obviously a Centaur, but I prefer the name "Prince" for the non royal King (is a strong piece, and the name "Man" seems to leave it on an inferior class from a Knight or a Bishop)… so, an animal to represent a "Prince"… I'm quite sorry because de name Lion is used otherway in chessvariants, but it was so obvious to me that I couldn't stand without using it…. ah yes, there were "Princes" on the first version of C'escacs, but they were too strong and too slow. Java applet to play (no computer moves yet). Very special thanks to Dave McCooey, who were interested on the game on the early design stage; its game inspired the C'escacs Pawn's moves, as I think capturing with a diagonal move is an interesting aproach. Later I made mail contact with him, and C'escacs born when the Pawn's three step moves where introduced because of some comments he made. He was also very kind computing finals for 169 hexes board… he was the first making dubt about the viability of the Prince and computed finals for that piece, now discarded while almogavars have been introduced. Thanks; you were right and the game is much better now. Thanks to Jaume Ferras, for many hours of brainstorming talking about a new chess variant and some of my first plays. Thanks also to [http://www.escaquejant.com] an interesting catalonian chess web, and the first Web to link C'escacs. 1. 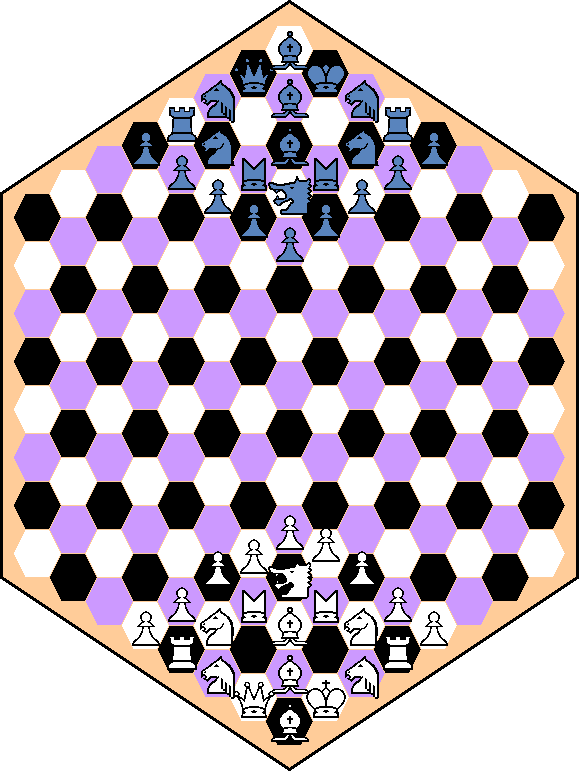 Note that color alternance is diferent of Glinski's board, if you use a "colored" central hex on Glinski's board then kings and queens will be placed on colored hexes (just a reason for using white central hex on Glinski's board). 2. The rule makes it unnecessary to keep track of which Pawns have actually moved. 3. Diagonal move is not incumbered by pieces lying to the right or the left of the thin line of travel. Pieces crowding the line are simply passed over.